Ron Shields photographed this immature Bald Eagle on Monday as it flew over Disposal Road, the epicenter of Meadowlands birding these days. 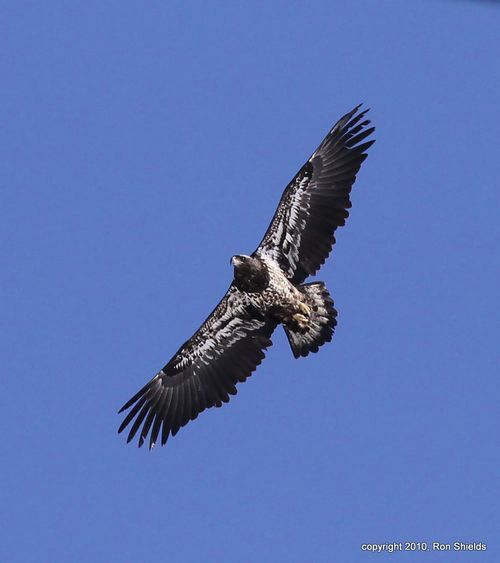 On Wednesday, Chris Takacs saw an eagle perched on a distant snag in the Saw Mill Impoundment. (Last Sunday, walk participants saw an eagle over that impoundment, flushing a couple of Golden Eyes and other nervous waterfowl. Just in time for weekend birders, Ray Duffy reports: "I did a loop around the area. My first stop was at Braddock (North Hudson) Park in North Bergen. 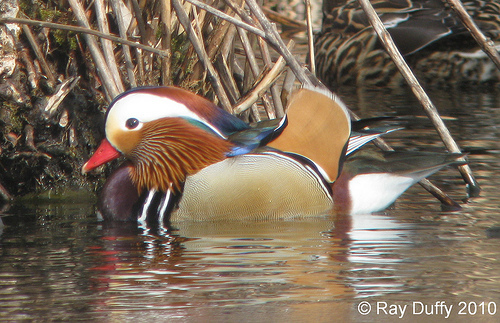 A drake Mandarin Duck was found here a few weeks ago and was still present. It's not countable, but it is a very pretty duck. Also on the pond were a female Hooded Merganser, and some northern shovelers. "From there I made a stop at Skeetkill and the Hendricks Causeway. Nothing going on at Skeetkill. I had a 6 six Monk Parakeets on the nests by the railroad bridge. "After another stop or two, I finished off at DeKorte Park. 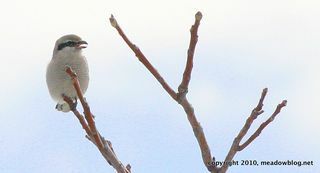 I missed out on the Northern Shrike by a minute or two. The female Common Goldeneye continues in the Teal Pond. I had a number of northern harriers along the landfills including a Gray Ghost [blog note: photo is from yesterday]. Only 2 or 3 Fox Sparrows on the Kingsland Overlook, no sign of any White-Crowned Sparrows. The monumental recording features the shrike calling, squeaking and buzzing, with a little Meadowlands wind as an added attraction. At 1:24, you might turn the volume down — that when the AMVETS Carillon chimes in. Around 1:42, a jet is kind enough to fly overhead. The next sound file below is for shrike addicts on the go. It weighs in at 51 seconds, and features our often-elusive pal's basic repertoire of noises. For a 40-second (slightly gruesome) You Tube video of the Disposal Road shrike by Greg Gard, click here. Directions to Disposal Road are in the lefthand column of this blog.